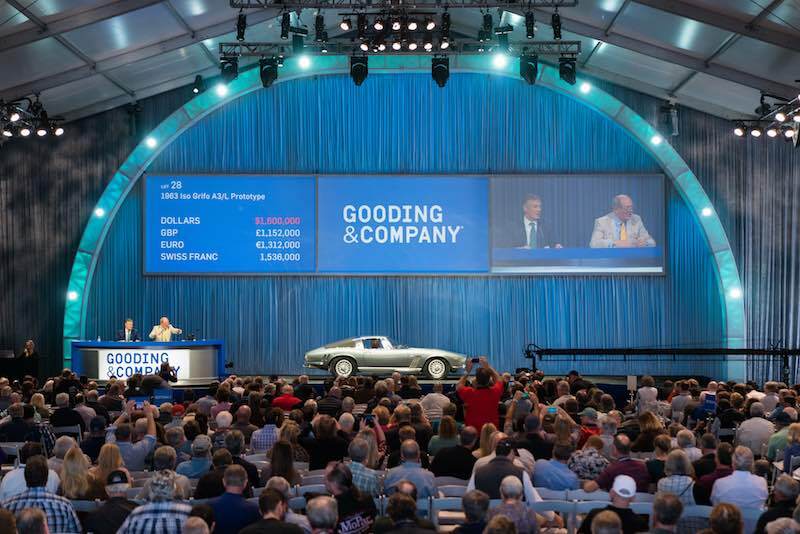 The Gooding Scottsdale 2018 auction was held January 19-20 nearby the Scottsdale Fashion Square in Scottsdale, Arizona, resulting in $49,215,650 in total sales and an 85 percent sell-through rate. 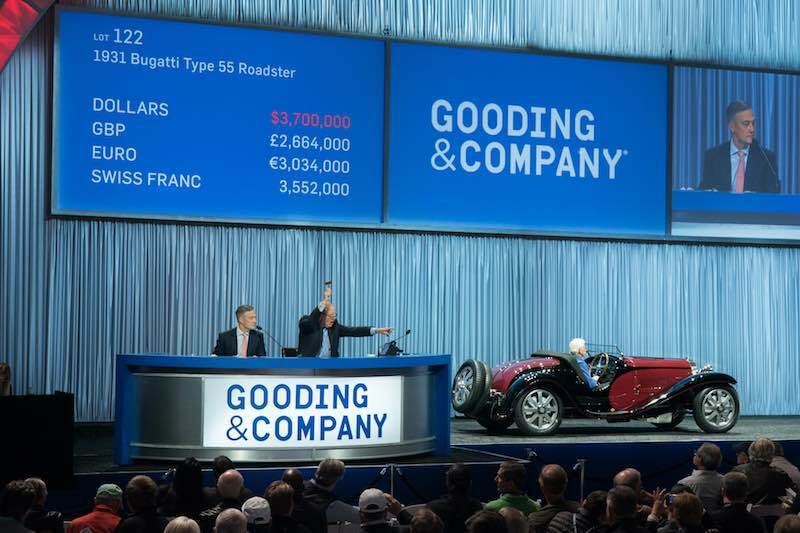 President David Gooding and Auctioneer Charlie Ross sold 110 of 129 lots at Gooding’s 11th annual Arizona Auction Week sale, with an average price of $447,415 per car sold. A total of 12 cars sold over the $1 million mark at the 2018 Gooding and Company Scottsdale auction, led by the 1965 Ferrari 275 GTB Speciale — originally owned by Battista Pininfarina — that sold for a record price of $8,085,000. The bespoke 275 was followed by the 1954 Ferrari 500 Mondial that made a record $4,455,000 and the 1931 Bugatti Type 55 Roadster that brought $4,070,000. The crowd erupted with applause after hearing that the 1967 Ferrari 330 GTS would be returning to the original owner’s family with a final sale price of $2,530,000. Additional highlights included the 2014 Pagani Huayra sold for $2,090,000, the Iso Grifo A3/L Prototype sold for $1,760,000, the 2015 McLaren P1 sold for $1,732,500, and the 1953 Ferrari 212 Europa Coupe sold for $1,067,000. The company also achieved a new record price for the Lexus marque with the Lexus LFA Nürburgring Package sold for $825,000. For complete auction results, visit GoodingCo.com. 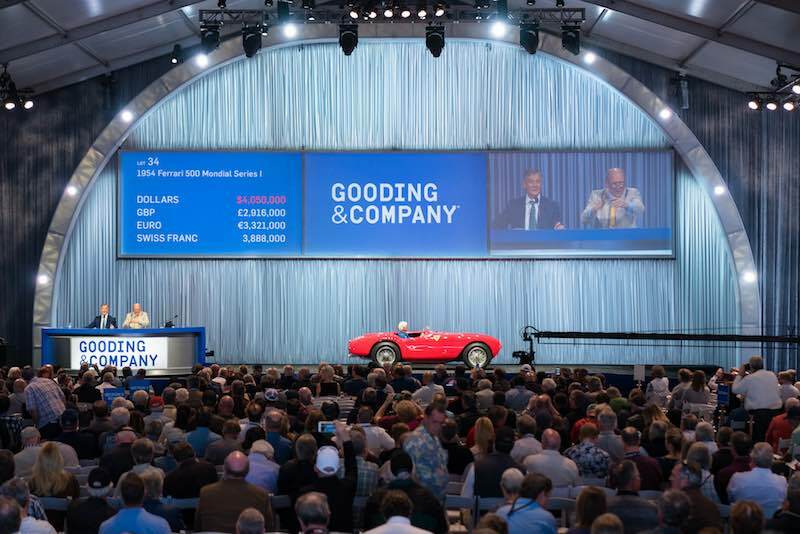 Gooding’s next auction will be staged on March 9, 2018, in Amelia Island, Florida during the Amelia Island Concours Week. The auction house has consigned three Porsches from a private collection, including the 1993 Porsche 964 Turbo S Leichtbau, the 1996 Porsche 993 GT2, and the 1996 Porsche 993 Carrera 3.8 RS. In addition, the company has consigned a 1967 Ford GT40 Mk IV (estimate: $2,000,000 – $2,500,000). For further information, visit GoodingCo.com.